When you take Celtic, Spanish, and Italian Music, and mix it up, you get the true nature of the Black Irish. For Twenty-five years this band has created an original sound that no other band has. With over 500 concert performances to date and airplay around the world, the band has kept very busy spreading their brand of progressive folk music to a large audience. Performing both traditional and original music the band is very focused on presenting acoustic music in a very exciting up-beat way that appeals to all ages. The band has written and recorded over 96 original songs that appear on any of the bands twenty-fve CD recordings. Many of the original works written by the band are based on Celtic history. 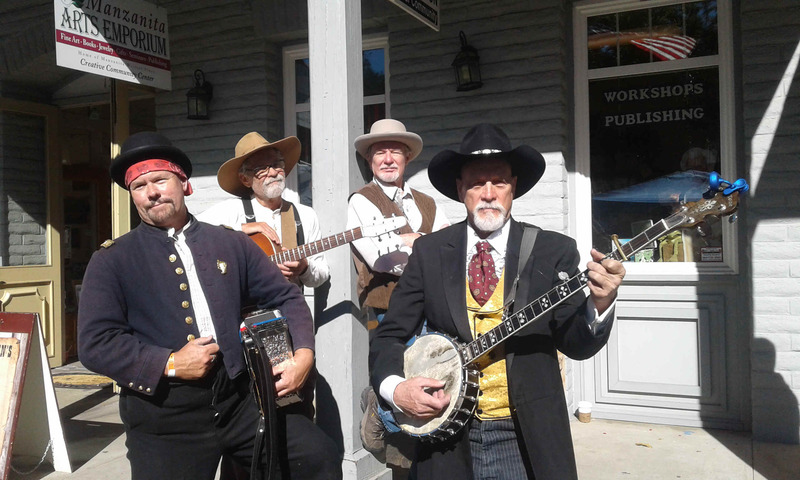 Hailing from the historic Gold Rush Country of America, the four member Black Irish Band have a musical style that is as timeless as the rugged landscape of the west, a tribute to the people whose lives were spent building the world we now take for granted. The band has a large compliment of traditional maritime and railroad music, as well as ethnic tunes in their repertoire. They excel at Irish & Scottish, Italian, and American folk music with an assortment of original songs and traditional western ballads. The bands musical style captures the spirit of the immigrants of this land, the men and women who tamed the Wild West. Patrick Michael Karnahan and Richard Restivo met on the set of "Back to the Future III" in 1989. This is when the idea of the Black Irish band began to first bloom. Both Patrick and Rick were in the "Hill Valley Brass Band," while future band mate Steve McArthur was given a speaking role as festival man #1. During filming breaks, Patrick and Rick began to formulate the idea for a traditional folk group that would cross cultural and musical boundaries...an acoustic folk band with no limits! At the first band meeting the name Black Irish was chosen. The strong vocals and up-tempo instrumentals breathe new life to old songs and present original material with a distinctive flair. The original songs of Patrick Michael Karnahan have received considerable airplay on various folk-rock and public radio stations.